I was chatting with a fellow marketer a few days ago, who had a client that did some radio ads. The ads started at 6am. My friend arrived at the office at 8:30am on the same day to a blinking light on his phone. It was the client telling him that the ads weren’t working because he hadn’t received one phone call yet! No matter what kind of marketing you do, patience is going to be the key. It’s like investments. In the short term you will see ups and downs, but over the long haul you will see consistent growth and gains if you stick with it. Lead generation is no different. It’s what keeps your business expanding, and it’s typically the one thing that business owners and marketers struggle to do. Continually bringing leads into your company takes strategy, consistency, and patience. There are a lot of ways to generate leads for your business. 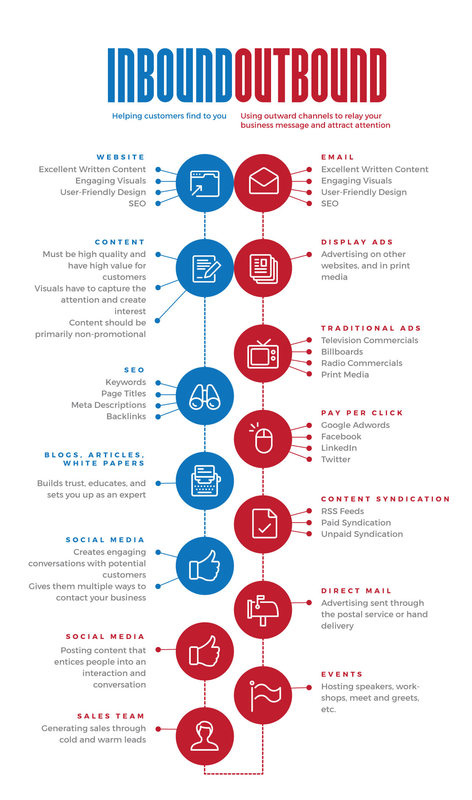 Check out our infographic on Inbound and Outbound marketing, and decide which ones will work best for your small business marketing endeavours. Would you like to learn where you should focus your small business marketing initiatives? Let us help you with a FREE consult. No strings attached. Get 30 minutes of clarity to makes sense of your marketing strategy. Just click here to book your meeting.